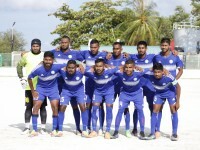 Maldives Correctional Service (MCS) has today signed a Memorandum of Understanding (MOU) with Ministry of Housing and Infrastructure to carryout Community Re-integration Programme for inmates as part of its efforts to rehabilitate inmates and release them into community as reformed and skilled individuals. Commissioner of Prisons Ahmed Shihan signed the MOU on behalf of MCS while Minister of Housing and Infrastructure, Hon. Dr Mohamed Muizzu represented the Ministry. 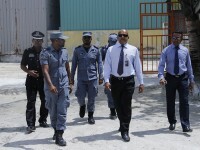 The ceremony was joined by top officials and employees of both institutions as well as inmates participating in the Community Re-integration Programme. The Community Re-integration Programme provides the opportunity for inmates with the best conduct and deemed as unthreatening for the community to work at STELCO’s sites at Hulhumale’ and earn an allowance-based income. STELCO contributed to the Community Re-integration Programme under their Corporate Social Responsibility (CSR) initiatives. 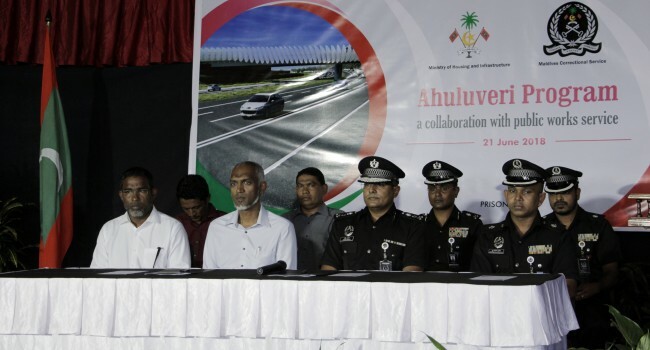 The Programme focuses on rehabilitation of inmates at prisons of Maldives Correctional Service, allowing inmates of good conduct and deemed nonthreatening to the public to work in the Hulhumale’ Bridge ring road project for an allowance.